Dwell with Dignity's pop-up concept, Thrift Studio, opens for a one-month run this weekend; don't miss the chance to snap up designer home decor items at a discount, all to support a great cause. Want to update your home with cool, one-of-a-kind pieces on a budget? It's your lucky weekend, because Dwell with Dignity opens its month long pop-up shop on Saturday, selling luxury home goods at a discount, in support of the non-profit's inspiring projects. 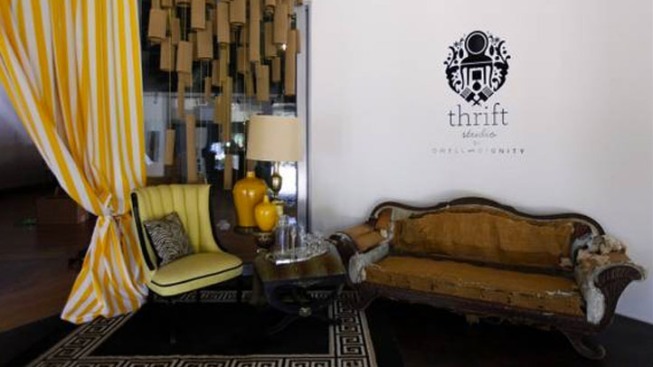 Recently highlighted on NBC's The Nate Berkus Show, Dwell with Dignity's Thrift Studio boutique offers shoppers designer decor that has heart. Thrift Studio will feature designer and vintage housewares from its amazing stock of donations from the individuals and high-end furniture makers that support Dwell with Dignity, and prices for the pop-up store are usually set at 50 percent below wholesale. Yes, you read that correctly. Local Dallas style stars including Samantha Reitmayer-Sano of Style/Swoon and Beth Dotolo and Carolina V. Gentry from Pulp Design Studio are creating vignettes for Thrift Studio, and we can't wait to check out their sartorial selections. Items from Dwell with Dignity's new partnership with glam bedding company Peacock Alley will be available as well. Taking over a large showroom space at 1616 Hi Line Drive in Dallas, Thrift Studio will be open Monday through Saturday from Oct. 1 through Oct. 29, and boutique hours are from 10 a.m. to 5:30 p.m. And if you're feeling frisky this Friday, join in the revelry at Thrift Studio's preview party, happening Friday night, Sept. 30, from 6 to 9 p.m. Members of Dwell with Dignity can snag an additional 10 percent discount at Thrift Studio, and entry into the pop-up will cost you $25. Every dollar spent during the month goes directly to Dwell with Dignity whose mission is stocking the houses and pantries of those escaping poverty and homelessness, giving families furnishings, home goods, kitchen supplies, art, and even food to help ease their transition to a new way of life. Co-founded by interior designers Lisa Robison and Kim Turner, the women behind Dwell with Dignity used their strong connections to Dallas' designer community to create the unique foundation. Visit the Thrift Studio pop-up during October and keep up with the latest news and projects from Dwell with Dignity via the group's website and Facebook pages. We also adore the accompanying blog that always lends great tips for changing your own living space in inexpensive and unique ways.